Today we introduce two new names from the London scene. The Excellos, who inherit traditions of the fruitful pub rock scene, and loud rockers The Fireworks. Stonefield are three ladies from Victoria in Australia. 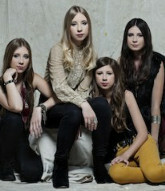 Elouise Walker from Los Angeles fronts the new band named after her first name, Elouise. We wrap things out with two singer songwriters, Steve Dawson from Canada and Graham Winchester from Memphis TN. Graham Winchester – Little Things.